Remember to sign up for next year! Thank you for sharing in the ups and downs of farming with us! Brrrr, what a week! Makes this coming week look quite cozy. It’s probably safe to say there aren’t many pairs of long underwear still squirrelled away after last week! We dug all ours out in a hurry, that’s for sure. It’s good to be going into winter with moisture in the soil, at least in the top foot or two that we see when digging root crops. The raspberries and asparagus, and strawberries, like all perennial or overwintering plants, can handle the cold and freezing/thawing much better with plenty of water in their “pipes.” You’ll note that this is opposite of garden hoses or, say, an outdoor shower–which we forgot to drain. The forests and prairies prefer the moisture too; life is just easier when you’re hydrated. This week we’ll start on the final big harvests of beets, celeriac, radishes, and turnips, then next week we’ll turn to parsnips and the thousands of pounds of carrots out there. With the cool weather all spring we decided this was a good year to make the jump to growing more carrots for winter wholesaling, and will continue selling to Just Food, St Olaf and Carleton and others, probably until February or March. Once all the roots are in it will probably be time to start washing, washing, washing for the storage share on the 14th, a grand total of roughly 7,000 pounds of food for that day. Then if we’re lucky and the ground isn’t frozen solid yet, we’ll take down the current greenhouse and move one over from the back field to replace it. We haven’t done a building in a little while, it’ll be fun to get the tools moving again! Folks often ask what we do in the winter, and lately we’ve been saying that our job slows down to full-time, maybe 3/4 time. We’ll get to play and go for walks a lot more, but growing 40+ different crops requires a lot of behind the scenes managing, and we’ll spend a month or so planning the field rotations and planting amounts, then ordering seeds, plus end of year budgeting and farm purchases. And the more equipment we get the more there is to fix, and build, and re-build, and tracking down new-to-us implements and parts could be made into a winter part-time job of its own if we wanted it to be. We’ll go on a couple small trips, including an organic farming conference or two. Overall winter is full but quieter for us, with more space in the days and weeks, time with friends and family, and a chance to plan and dream changes and improvements to what we do and how we do it. Speaking of which, hopefully in December we’ll be sending a brief survey for you to fill out. We hope you feel free to let us know what you think, whether or not you think we’ll be glad to hear it. In writing or in person please let us know if there’s anything we can do to make the farm a better part of your life. It’s what we do, and we want to do it well for you. Last year’s survey prompted us to focus on improving the driveway so it made an actual parking area, and expanding pickup hours. We’ve been very pleased with these two changes, and we hope you have been to. The driveway will get a little touching up and maybe be made a couple feet wider for easier turning around. (That fun little gravel pile near the barn does have a purpose in addition to being a fun place to play. That’s one of those things that looks like an unfinished project to us but is almost worth making the permanent gravel storage place just for the easy fun value.) Strangely we don’t have big improvements on our mind for next year on the side of the farm that you see the most. We’ve got plans up our sleeves for changes in the field, but if there’s anything we can do, with crops or with logistics, to make it work better for you, let us know. We look forward to planting more seeds for you next spring (we’ll start in March), and maybe we’ll see you around town through a beautiful winter season! That was a very hard first frost last Saturday night — our thermometer registered 19 degrees. We had picked all the tomatoes beforehand so didn’t even bother trying to cover them, and that night put a decisive end to all the summer crops. There are a few, a very few, tomatoes and peppers left in the hoophouses, for this week. They survived but are just about done making anything edible. Combined with the tomatoes we’ve been trying to ripen in trays, we’ll see what we can find. Mostly, now, it’s time to eat hearty prep-the-body-for-winter foods. The cold nights were perfect for parsnips and brussels sprouts. Without those temperatures they’re nowhere near as flavorful, and each night of cold can make them even sweeter. So this week’s harvest should be sweeter than last week’s. Same with spinach, kale, and carrots. Watermelon radishes managed to survive last week (we had simply run out of black spanish ones), they do have some scars, but should keep fine. They are very mild, especially if you choose to peel them or use the skin just as a handhold while eating as finger food — they make great snacks, or dipped in hummus or dressing with other cut veggies. We might pick some daikons again — but beware the top 1-3″ was aboveground and looks translucent and frozen — it tastes fine but the texture might be grainy and/or it might not keep very well. Eat soon. For sweet potatoes, we’ll be putting out dirty ones for you to choose, alongside the clean ones– dirty ones store longer. The clean ones are reliable for a few weeks, and in our house they get eaten before then, but if you want to keep them longer we recommend taking dirty ones. In with the clean ones you’ll also see some with flat ends — these were damaged during harvest and won’t keep quite as long, but are equally delicious. Sweet potatoes store best at 55-60 degrees, putting them in the fridge can cause hard centers which never cook. Spinach, oh spinach. Last week’s frigid nights finally brought out the super sweet flavor, but now the plants are so old and struggling it takes enormous patience to pick the bushels needed to give everybody a bag full. So this week we will pick some, but it will be open for U-pick as well. For small quantities, we recommend picking leaves with your fingers, to avoid all the yellow leaves. We should have lettuce and greens this week, too. They may look a little beat up and tougher for it, which they are, but they’re still yummy. Due to their ordeals they might not keep as long in the fridge as usual. Brussels sprouts we’ll have bulk and on the stalk again — they’ll keep longer on the stalk, in a bag in the fridge. We don’t know yet about cabbage it sometimes doesn’t recover from those temperatures. Otherwise we’ll also have the same as last week — celeriac, beets, winter squash (store on counter, not fridge), purple carrots, onions, leeks, turnips. Happy fall eating, and thanks for sharing in the ups and downs of farming with us! Kale and Spinach — check the board for amounts. Kale is next to the greenhouse, and spinach is east of the driveway, in the south field (south of the former cherry tomatoes.) We will also have a small quantity of spinach available in the barn. We’ll keep the kale open for picking until significant snow is in the forecast. Spinach is only open for picking this week, after that it’ll be time to put some rye down as a cover crop/ soil-building crop for next year. For herbs, parsley, thyme, oregano, sage. Raspberries and Flowers are done from the cold. Can still taste those last berries though! This week’s selection is : Garlic for $1 / head, Carrots and Beets for $1 / lb, Kale for $3 / lb, Winter squash, butternut and carnival, $.75/ lb, Celeriac for $1 / lb. Garlic can always be purchased in the barn, no need to pre-order. It keeps reliably until early January, and some will last into March. Last Share Pickups are Monday October 28th and Wednesday October 30th. If you’re not doing the storage share we’ll miss you, have a great winter!! Remember to sign up for next year!! A $25 deposit by Oct 30 will save your spot. After that we will give one more reminder, then begin contacting folks on the waiting list. If you know of anyone interested in a share for next year, we may have spots available, have them contact us soon. Share Pickup Hours — Monday, Wednesday, (not Friday this week) 2:00-6:00pm. You can U-Pick any time. Toast the cashews in a dry, heavy skillet over high heat until they start to brown in spots and become fragrant. (Be careful not to over cook them, as they will burn very quickly once they are toasted.) Immediately transfer the nuts to a dish to cool. Melt the butter in a soup pot over medium-high heat. Add the leeks or onion; cook, stirring frequently, for 8 minutes. Add the ginger, cumin, cinnamon, fennel, allspice, and nutmeg; cook, stirring, for 1 minute more. Add the carrots, sweet potatoes, and stock or water; stir to combine. Partially cover the pot, reduce the heat to medium, and bring to a simmer. Cook until the carrots and potatoes are tender, 15 to 20 minutes. Transfer the mixture to a blender. Add the toasted cashews and process to a smooth puree. If it seems too thick for soup, add a little more stock or water. Transfer the soup back to the pot. Add orange juice, salt, and pepper to taste. Gently heat the soup over medium heat, stirring frequently, until hot. Ladle the soup into individual cups and place a dollop of yogurt or sour cream in the center of each. Garnish with chives. 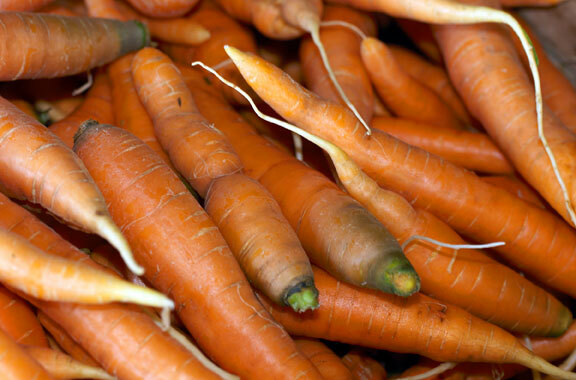 4 medium carrots, cut into 1/2 or 1″ coins – steamed until tender. 2 medium squash like carnival, acorn or delicata, or one medium butternut. (feel free to mix varieties) – halved, seeded and baked at 375 until tender. 3 medium apples peeled, cored and chopped. Add 2″ of water, cover and cook on a gentle boil until tender. For this recipe an immersion blender works best but you can also use a regular blender. For a more rustic texture use a regular potato masher. Add the carrots to the apple/potato mixture and blend/mash until smooth. Next scoop the squash from its skin and add to pot, blend/mash once again. Thickness can be adjusted by adding water, veg/chicken stock, milk, etc. Once blended bring it back up to a short boil and it’s ready for spicing and serving. There is a natural sweetness to this recipe but you can go either sweet or savory. Spice to taste with salt, pepper, garlic, maple syrup. Can be topped with butter or cheese..